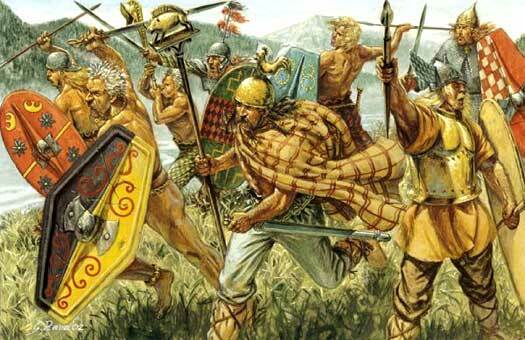 In general terms, the Romans coined the name 'Gaul' to describe the Celtic tribes of what is now central, northern and eastern France. To the north of these were the tribes of the Belgae, divided from the Gauls by the rivers Marne and the Seine. The Tungri may have been included amongst the Belgae, being located in the midst of them by the middle of the first century BC. They apparently had a tribal capital at Atuatuca (modern Tongeren, which remembers the Tungri name). This was also attested as being the tribal centre of the neighbouring Atuatuci tribe, in what is now Belgium's Limburg province (raising the possibility that the Tungri and the Atuatuci were one and the same). They were neighboured to the south by the Caerosi and Condrusi, with the Atuatuci dominating them to the west and north, and with the Germanic Sicambri lying across the Rhine to the east. The Belgae would seem to be an eastern branch of Celts who migrated to the Atlantic coast some time after their Gaulish cousins had already established themselves to the south. Their dialect probably used a 'b' or a 'v' sound where their western cousins in Gaul used a 'w' sound, opening up different interpretations for their names. However, the tribal name Tungri does not appear to be Celtic. After removing the Latin suffix 'i', the 'r' at the end of the word, 'tungr' looks Germanic. It probably comes from the proto-Germanic 'tunga', modern German 'zunge', meaning 'a tongue'. This would make the tribe's name the 'tunga' plus '-er', meaning 'speakers'. It shows that there were no clearly defined boundaries between being Germanic or Celtic in areas which held both peoples. A degree of cross-filtering of both language and leaders seems to have been very much the norm. Variations on the name include Tungrians and Tongri. To back up the apparent Germanic origins of the tribe's name, the Tungri are sometimes actually listed as a Germanic tribe, and possible relatives of the Paemani. 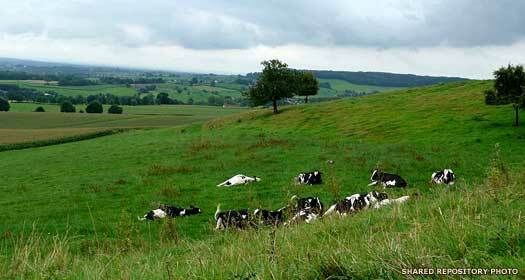 They occupied territory in the northern Arduenna Silva (the forest of the Ardennes), along the lower valley of the Meuse. Although they were faced by a swathe of Germanic tribes to the north and east, when it came to repelling any raids they were supported by the neighbouring Belgic tribes, especially the Nervii, Remi and Treveri. They were mentioned in the Notitia Dignitatum, which names the tribune of the First Cohort of the Tungri. This unit was stationed along Hadrian's Wall at Vercovicium (modern Housesteads in Northumberland), and their tribune was tasked with preventing the northern tribesmen from seeking residence in Britain, or from raiding there. In relation to their occasional listing as being Germanic, Tacitus said the following about the Tungri: '[The name] of Germany... they assert to be a modern addition, for that the people who first crossed the Rhine, and expelled the Gauls, and are now called Tungri, were then named Germans; which appellation of a particular tribe, not of a whole people, gradually prevailed; so that the title of Germans, first assumed by the victors in order to excite terror, was afterwards adopted by the nation in general.' The clear suggestion is that this group, who by the first century AD were being called Tungri, originally used the word 'Germans' to excite terror in their opponents, and that this name gradually came to be used for all similar tribes. However, Tacitus' remarks can be misinterpreted. Most likely, 'German' simply means 'spear man', just as 'herman' means 'army man', ie. a soldier. Caesar enters the country of the Eburones, forcing the rebellious Ambiorix to flee and his co-ruler to commit suicide. Despite this apparent capitulation, the country of the Eburones proves difficult for the Romans. Caesar invites the neighbouring people to come and plunder the tribe and, after stubborn resistance, Caesar burns every village and building that he can find in their territory, drives off all the cattle, and confiscates all of the tribe's grain. The Germanic Sicambri take the opportunity to cross the Rhine and surprise many of the plunderers, seizing a large part of the Eburones' cattle. The Eburones are destroyed by this action and no further mention is made of them in history. Their land is occupied by the Tungri. It seems strange that the Tungri are not mentioned in relation to the Celtic revolt of 53-52 BC, although their geographical position places them well away from the main fighting. Could the Tungri occupation of the lands of the Eburones instead be a sanctioned takeover of the Eburones survivors by a Germanic warrior elite? This would bring the Germanic element into a tribe that is also counted as being Belgae. As such, they may have ruled themselves out of a Romano-Gaulish conflict. Alternatively, the local Atuatuci are not mentioned again after 54 BC, just as the Tungri appear on the scene, and occupying very similar territory. Could they be formed of an amalgamation of the Atuatuci and Eburones survivors, both of whom already have a Germanic element to their make-up, just like the Tungri? This becomes even more likely when it is remembered that the Tungri have a capital at Atuatuca (modern Tongeren), which is also attested as being the tribal centre of the Atuatuci. Sided with Rome during the Batavian revolt. The Tungri are first mentioned in connection with Hadrian's Wall in Roman Britain on a stone at the Carrawburgh fort which is dated to this period. The First Cohort of the Tungri is mentioned in a total of ten inscriptions, and as well as postings to Carrawburgh and Housesteads they also do turns of duty at the forts of Chesterholm and Castlecary on the Wall. A detachment of Vardulli cavalrymen from northern Spain and Batavi from the Netherlands also serve on the Wall in the same period.